In the voice of Antonio Licciardi - This photo reminds me of the times I spent fighting the war for my country, Italy. At just 16 years old, me and other young boys were told we had to go join the battle at the northern border of Italy facing Austria. Most of us had never held a weapon, let alone experience the cold weather of the north. Yet, there was nothing we could do - our country needed us. So, we barely had any training and were given a bag with a few essentials to carry along with us, food, water, a uniform, some medical supplies, and weapons. Most of us southerners did not last very long at all. We were becoming malnourished, sleep deprived, but worst of all we were hypothermic. 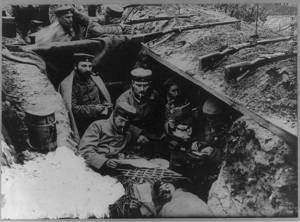 The trenches were just extremely cold with all the snow and harsh weather of the winter. Our army was so desperate for what they considered “able men” that they tried to keep us there as long as possible. Everywhere around us men lay dead, their bodies being preserved in the snow. Eventually we were transported back to Sicily when our generals decided we had enough. 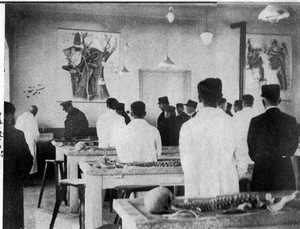 A lot of us, myself included, required amputations to remove the dead limbs from our bodies. However, this did not mean that we were no longer able. A few months after my recovery, I was sent another enlistment notice in the mail. I was able to appeal to my local government and avoid being drafted again, but what crazy times those were. Most of my late childhood days were spent at the war, or being reminded of it at home. This photo reminds me of the conditions I faced while in the war, although the pain of war did not stop once I returned from the warfront, and I’m sure that this is true for all soldiers of war. The social and psychological effects of war are sometimes devastating. Men and families didn’t talk about these feelings too much though, and just tried to carry on like everything was normal. While Japan is close in proximity to Korea, we are very different. Even when we were under the Chinese dynasty we have developed our own culture, customs, and traditions. While Japan is clearly more advanced technologically and overall developed, we can incorporate those ways and still retain our own traditions and customs. A culture’s uniqueness and difference should be praised not erased. Our differences are what makes us special. During the annexation, Koreans were treated in the most inhumane way. Some people were taken as slaves, women sold to brothels, children forced to become Japanese, and some literally shot down when they spoke up. We demand to be free from their tyranny. Although we are a small country we have the strength and determination to make it. Here in Korea all men are drafted to serve in the war. But my friends, family and I willingly sacrifice our lives so our future generations can be free to live their lives. We would rather die trying than to just sit still and passively accept this injustice. Even if we fail as a young country we can at least say we tried to fight for ourselves and held on to our own pride and identity. Luckily, we have gained the ally of the United States. They recognize our desire of our people to be free and democratic. We want to be like them, a country that is for the people by the people. Their military strength and reputation is an immense help in our efforts of the war. While fighting on Korean soil I witnessed the merciless slaughter of our women and children. This is why I signed up to be stationed in Japan. Enough of the destruction of our land, it was time to take the fight to them. All we ask is to be respected. We will no longer tolerate Japan stealing our land and erasing Korea bit by bit. Other countries may underestimate us because our size but our patriotism and nationalism is what will give us the strength to survive. In the voice of Catherine Boltz- Seeing this photograph of the German soldiers invokes in me a feeling of deep unease. This war is being fought in a different part of the world, one that was once my home, but only for a short amount of time. My parents, my sisters, and I left Bavaria, Germany, and set sail to America shortly after my birth in 1890, and I haven’t been back to my birth country since. In fact, I struggle to find a connection to the land my ancestors had lived in for many generations. My family left Germany because of the poor conditions so many lower middle-class farmers were facing: our land, and thus our sustenance, was being taken away by the government. My parents thought our best shot at survival was to seek out “the land of opportunity,” and their hunch proved to be correct. My father quickly got a job on the railroad, and he soon saved enough money to purchase a house here on Staten Island. Although life New York is much different from how my family lived in Bavaria, we quickly integrated ourselves into the American culture, and although I identify myself as German-American, I have a much stronger connection to the country I have lived in for the past twenty-something years. Today, from an American perspective, I see the tyrannical intentions of the Kaiser and how many Germans are blindly supporting him, simply because his cause is the first thing since the 1870s that is truly unifying the country. It has become more clear in the past year or so that if our neutrality ends and the U.S. enters this horrific war, we will be fighting against Germany and the other Central Powers. I, like many others, am utterly disgusted by Germany’s unrestricted submarine warfare that has killed many innocent people, including Americans. Still, it’s strange to me that one day soon this country may officially consider Germany the enemy. Surely I detest the war, the motives behind it, and all the death and destruction it brings, but how am I to hate the soldiers who love their country and believe they are fighting to protect their people? When I look at this photograph, I don’t see enemies- rather, I see men who are tired and presumably frightened to their very cores, men who love and are loved, and men whose lives may have ended before this photo even reached me. I can’t quite shake the thought that if my family never left Germany, I may have recognized any of the men in this photo as my neighbor, my long-time friend, or my lover. In the Voice of Mohamedhussein Dewji: My wife and I moved to East Africa with our two small children when we were only in our late 20s. Though we had some family already settled in Songea, it was still a huge adjustment to leave our home, friends and family. Both my little boys were quite mischievous and were excited for the move. I felt they were able to pick up the language and culture faster than us and had an easier time making friends. My wife was really the one who suffered the most in the beginning because while I was constantly outside trying to find work and meeting new people, she was very isolated. Her cousins that were already here were in a neighboring town called Dar es Salaam and the people around us were not very welcoming. The local people did not understand our language or customs and the Indians that were already here had already developed new customs and new friends. It took us both a long time to adjust and make new friends. I was also worrying quite often because when my wife would go to the local market, some of the patrons would call her names and harass her. My family was already poor in Indian because there was very few jobs and while there was a lot more opportunities in Songea, there was a lot of hatred because I was an outsider trying to take jobs from the local people. The job that I had originally been offered had fell apart when some of the locals protested my hiring. Many of the local shops did not want to hire an outsider who did not look or speak like them. It was only until we had lived in Songea for a few months that I realized by sons were having just as hard of a time adjusting as my wife and I. The lack of community and culturally similar people that were in abundance in Gujarat was hard to adapt to. After talking to some of my cousins, I realized that there was more Shia muslims across town that had created their own little community. In the end, I moved my family there to try and provide them some comfort in this unfamiliar place. We quickly saw a change in the behavior of the local people. Because there was so many more muslims, the local people had already accepted our presence in the town and work environment. I was able to get a local job and provide a steady income for my family. My youngest son, Gulamali was able to attend the local pre-school and make many friends while my older son quickly got involved in sports and was able to meet different people of unique cultures. The one who benefited most would probably be my wife, however. She was able to go to the local market often with other women neighbors and I was not worried that she was going out alone or would be harrassed with. Because our culture is centered around community support, it was so important for our family to have that sense of belonging with others and know that we could be at home in a land that wasn’t ours. During the early 20th century, many countries had growing populations of overseas Indians. As an overseas citizen myself, the discrimination we faced was also growing. I’ve come to see and realize that people don’t like it when things change from the norm and they especially feel unarmed by people who look and act differently to themselves. I’ve experienced this kind of discrimination within my own country. Muslims are a big minority in India, but yet somehow religious unrest continues to unravel into furthering divides between two groups of people and making many Muslims feel uneasy in their homeland. This is similar to the discrimination the Indians in South Africa felt, being such a big minority there. But, the unfortunate thing is that whenever Muslims or any minority group try to leave to go to a new place in hopes for freedom and acceptance, they often don’t receive it. The discrimination Indians feel in South Africa is one that I have experienced in all of the places my life has taken me. The Indians in South Africa moved there undoubtedly for better opportunities, but it came with a tradeoff. This is a hard truth that many immigrants have to face; that their pursuit of something better may come at the cost of their own discrimination. It’s as though people acknowledge that everyone is an individual, but when it comes to a new group of unknown people, all of a sudden, stereotypes and generalizations come into play. But, I’m a firm believer that your hard work and accomplishments will speak for themselves and will show the kind of person you are. The resistance the Indians displayed in South Africa was admirable and demonstrated the resilience of my people. My goal that I hoped to accomplish by coming to the US for research was to conduct projects that would ultimately help me in figuring out how to better my city and my teaching. But I also wanted to show people who’d never really been exposed to my people all that we’re capable of and that the East isn’t lesser than the West in any way. The South African government restricted the Indians’ freedom by ordering them to carry ID cards at all times. In a similar, but less sever manner, other countries restrict immigrants based on the visas they are able to obtain. In the US, on certain visas, you can’t freely go to visit other countries or work. When I came to the US, I struggled to find the acceptance. But nevertheless, I found people who saw me for who I was and all that I was trying to accomplish. It is difficult to focus on your goals when you feel like an outsider. I understand why Indians in South Africa showed resistance. It doesn’t feel good to feel like you’re an outsider to the point where you’re made inferior. I hope in the future that we learn to see past race and nationality and can come together and unite on our differences and not let them divide us. When I look at this photograph, I am inclined to believe that the mangled foot I am looking at came as a result of medical malpractice or disease of some kind. How else would it appear in such a deformed manner? However, I have learned recently that this very painful looking alteration of a woman's foot comes as a result of a cultural practice in China and I cannot help but wonder, why? Then I am reminded that they do these crazy things for us in an effort to be loved for their beauty. What other choice do they have? Outward appearance is the extent to which women have real control over their lives. Yet, they use that control to limit themselves further by binding their feet. My parents taught me that beauty can be found in art, like the music that they played during their lifetimes. They share a passion for art in more traditional forms like paintings and orchestral compositions, and a an appreciation for elaborate art and architecture. At home in Vienna, everything was beautiful and extravagant, perhaps because they thought that everything was perfect before the War. Now, that golden facade has been broken to pieces, and the only thing that is beautiful to me now is bare honesty, but all of a sudden women are wearing "makeup-" neither of us (myself or my father) are entirely sure why, it makes them look rather whorish. My father doesn't quite understand this idea of beauty that is being upheld in the East, either. It lacks the honesty that Vienna lacked prior to the War, which leads me to believe that it will not be long until the fall of superficial beauty occurs. 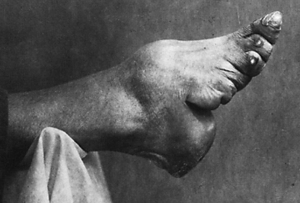 In fact, with the practice of foot-binding, that process seems to be approaching even sooner than I thought. The difference here is that the dishonesty is far more apparent in the deformed shape of feet. The effort to keep feet small is in vain and creates only a more aesthetically displeasing outcome that also renders feet unable to function in the way that they are supposed to. In the voice of Dr. Beniamin Behman: Being a young man that greatly appreciates education, this picture reminds me of the importance of seizing every opportunity possible to make the most of one's education. I know that education is a privilege and not something to be taken for granted; where I live (in Egypt) there is a lack of proper schooling. Egypt was under british rule when I was a young, and it was only for the extremely elite to be educated in Egypt. Most of my friends I grew up with when I was young did not have as much money as my family did, so they could not afford to go to school. I was blessed with the opportunity to grow up in a family with enough money who could afford to send me to school. Thus I went to school every day with joy and gratitude, knowing that I was privileged with a great opportunity. The lack of proper education forced me leave Egypt in order to pursue my dream of becoming a physician because the medical schools in Egypt were not of high standards. I knew that medical schools in London was much better than the ones in Egypt, so I went to London for medical school. I completed my training in Medicine and Surgery in 1918 in University College, London and returned to practice medicine in Egypt once I graduated. I feel that it is essential to realize the blessing of school when gone to with a mindset of hardwork and determination. This picture reminds me that through my schooling, I was able to make something of myself - I was able to find my purpose. I worked very hard to accomplish my dream of becoming a doctor. Through my education I was able to build a hospital that already served, and will continue to serve, thousands upon thousands of people. Furthermore, If it were not for my education, I would not have been able to support a family of my own. I am thankful to say that God blessed me with the education to be able to start my hospital and live a life that is so full of purpose. All my dreams came true because I knew my goals and my education was the means by which I could accomplish my goals. I was happy to see that the education system in Egypt began to get better soon after I graduated from medical school and came back to Egypt. In 1922, Egypt gained independence from britain, which was the start of an improved education system in my country. After direct British rule ended, Egypt adopted a new constitution that proclaimed the state's responsibility to ensure adequate primary schools for all Egyptians. Although this is a wonderful law, it was not followed right away. I still saw that many kids were not being educated in my country. However, in 20-30 years after this law was implemented, I finally saw enrollment to schools skyrocket and education became something a majority of people had access to in Egypt. 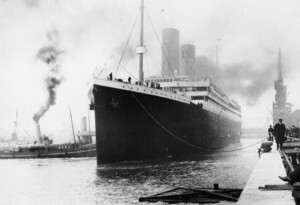 When the Titanic sunk in the year 1912, I was 18 years of age. Only two years prior to this, I had come across the Atlantic Ocean on steam ship named the Madonna that sailed from Naples and arrived in New York. While looking at this picture, a powerful sense of fear comes over me. I use the word “fear” in more than just one sense here. First, this picture makes me a little bit afraid of sea-travel. Hearing of the story of the Titanic and how it sank due to hitting a mere iceberg serves as proof that no one is ever truly safe, especially when leaving your homeland to travel for the first time to a completely new place. If you really think about it, I could easily have been one of the casualties on board the Titanic; only two years separate my voyage across the deep and that of the Titanic and both ships took relatively the same paths. Or, the Madonna, the vessel that brought me to this country, could have been the ship to hit an iceberg and sink, killing a majority of the passengers on board. If this were to hold true, then the lives of my child and wife would be extremely different. My daughter would actually not even exist, and I would never have married a woman; my direct bloodline would end abruptly in the freezing Atlantic Ocean. I use the word “fear’ in a second sense with regard to respect. Thinking about the shipwreck that occurred, I have come to respect immigrants who give up their present lives in search of a better one for their families and travel by way of the ocean. This isn’t to say that I have only gained this respect now; the most transformative experience for me by far was coming to New York on my own to make a new life for myself with hundreds upon hundreds of other Italians. There are so many risks that each person takes when leaving their home and everything that is familiar to them, and each one is certainly aware of them. These risks, though, are usually associated with life in the new country; how hard will it be to find and maintain a job that pays well enough to support a family, how terrible will the living conditions be in an extremely tightly packed urban environment such as Manhattan, etc. On the other hand, learning of the shipwreck of the Titanic reminds every immigrant of the risk that is involved with the literal journey they take over the sea. Once a ship leaves the port, it is left in the hands of fate. It will always hold true that anything can happen to anyone in any set of circumstances. This is precisely why I have come to respect the entirety of the immigrant community in New York as well as myself so much more. At this point in time, if I were back in Italy and were given the chance to sail to New York knowing about the tragedy of the Titanic, I would still go forward with the trip; I wouldn’t change a thing, no matter how frightening the thought of sinking in the middle of the ocean may be. I remember this deadly epidemic well. I was a young girl, just about ten years old. Everyone knew someone who died. The fear that surrounded us was paralyzing. No one knew who was going to get it next, and there seemed to be little one could do to stop it. As a child, I didn’t go out much. If I recall correctly, by this time, I had left school. Most of my time was spent indoors. My sister and I spent hours upon hours making hats to sell in the neighborhood. Additionally, my parents were very strict and traditional, and they did not like the idea of their daughters roaming the streets of Brooklyn. Speaking of my sister, she was quite the troublemaker. It became tradition that when someone in your house died of the flu, the family would hang a mourning wreath on their door. As I said before, we had a lot of free time to ourselves. For fun, my sister Felice would order mourning wreaths and send them to random households! She would watch from the window and cackle as the unsuspecting families were filled with horror and confusion. Luckily, my immediate family was safe from the flu. But, I can’t say I would have been surprised if Felice came down with something as a punishment from God for her mischief! I remember thinking that the Japanese seemed so far away that we would not have to worry about them. But slowly we would hear of what they were doing in Korea. The idea that they could enter a country and attempt to change their history and culture was a horrifying concept. To add on to that, Korea was an important part of the Chinese economy, so Japanese imperialism there greatly damaged not only the economy, but the political power of China as well. When we were defeated in the Opium War and the westerners brought imperialism to our lands, it was painful enough, but for Japan to surpass us as well made us realize that perhaps the dynasty was failing us again. We had hoped that the Japanese would be satisfied with the land they’d taken, and continue to work on developing it more. But I suppose the second Sino-Japanese War later in the thirties and forties was inevitable. The Chinese government was Our initial failures made it evident that China had not modernized enough, and our internal political stability only served to weaken our forces further. The dynasty failed to deal with this threat, and later, so did the nationalists. Although I can see the benefit of modernization brought about by the Japanese, the thought that one may lose control of one’s ancestral home to a foreign power is not worth the trade off. I would much rather continue sending money to improve the infrastructure of my village myself for a few more decades than surrender my home. Many of us working in America send money back to our villages as a whole in order to build roads, canals, and especially schools. If we are to protect ourselves, we must educate our children to have a stronger future. Until our nation could strengthen as a whole, nobody was safe from the Japanese, my own daughter in law would later be very lucky in her ability to flee from them. However, the fear and danger was constant and extreme, and the nature of my work would make it impossible for me to guarantee the safety of my family in person. I often wonder what would have happened had we been able to organize our troops better during the first Sino-Japanese War, or what would have happened had we been able to stop the Japanese from occupying Korea all together. If only we were able to organize our own government better, or had been able to modernize alongside the other countries. 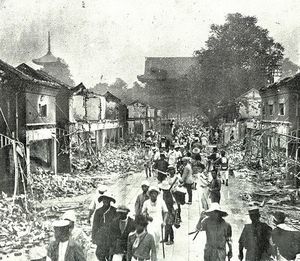 Many of my fellow overseas Chinese felt the same regarding the threat of Japan, and many of the family associations have agreed that in times like this we can only work harder to send supplies back to our villages. There are times that we can only lose. For me, this civil war is likely a loss regardless of the outcome. The social and political unrest in China has once again divided our nation, and this war will not solve anything whether the winners are the communists, nationalists, or the Japanese that are encroaching on our land. Our people have persevered through countless wars and political shifts for thousands of years, and now we are dabbling in government systems that we have never dealt with before. While both sides argue for their cases, there is no doubt in my mind that once in power, things will inevitably get worse for our working class. There are always claims that the working class will have a better life, but I am skeptical to how this will be brought about. Look at how we were promised democracy by Sun Yat Sen, but got Yuan Shikai as a dictator, who was no better than the warlords and emperors before him. We have to depend on our own localized governments and militia, and even then we are targets for everyone. Chang Kei Shek seems like just another land-owner seeking more power to me, and his violent attacks on the people - regardless of their political affiliation - only affirms this to me. One cannot claim to be seeking a better future for the people while allowing his armies to ravage villages, failing to fend off invaders, and lacking the skills to coexist with other political groups. But when I look at the Communists, I can’t help but be apprehensive. They too, make many promises, but I can’t help but fear that they will take all that our family has worked to maintain and grow. We are merely successful peasants, but even so, I fear that what we do have will make our family a target. I have also worked abroad for most of my life, and the attitude towards men such as I tend to be unfavorable among the Communists, they may even see my wife as elitist. While I still want to protect my family, I am close to powerless in our village. I will admit that looking at this photo makes me think of my own children. I am concerned that they will have to grow up without me while surrounded by turmoil from all factions. I want to protect my wife, and keep our ancestral home. But I am merely one man. In America at least I can work to send money and supplies. I have already begun speaking to some of the others at the family association. We have developed a plan that will allow us to send ammunition from America to China without getting caught. For now, I can only look at these pictures, and wonder how my own family is fairing while I am powerless, thousands of miles away. Hiram Bingham, after traveling extensively through the Peruvian countryside both by foot and by mule, arrived at a city lost to the ages, whose location was a secret kept by locals for hundreds of years. This city was Machu Picchu and it is a modern architectural wonder. He found it on July 24th, 1911 on a cold and rainy day, however, the tumultuous weather was not enough to stop this determined explorer. What is most significant about this site is that it was somehow left untouched by Spanish conquistadors and so none of the typical defacement is present at this site. Machu Picchu is located in between Cuzco and the Urubamba Valley, (only 80 miles from the Peruvian capital) and is tucked away into the mountainside. 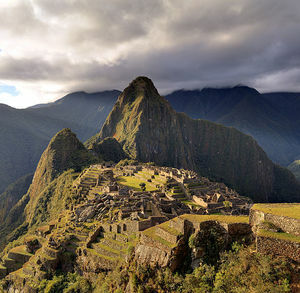 Outfitted with over 3,000 stone steps, Machu Picchu is widely thought to have been the vacation site of Incan emperors. Initially though, historians believe it to have been built specifically for an emperor known as Pachacuti, who lived from 1438-1472. It was built in classic Incan style, and contains three main structures: the Inti Watana, the Temple of the Sun, and the Room of the Three Windows. However, if you visit Machu Picchu today you will be able to see that much of the outcroppings and outlying buildings have been repaired (this is done with the intention of providing some of the annual 300,000 tourists a better visual of this monumental structure.) The town can be thought of as being divided in two different ways: into an upper town and a lower town and an agricultural sector and an urban sector. Carefully thought out and planned, elaborate irrigation channels and terrace gardens dot the mountainside of this structure. The most astonishing thing about Machu Picchu’s design is the way that the Incans were able to adapt to the challenging terrain. For example, Machu Picchu is situated along two major fault lines, and as such, typical building materials such as “mortar” was unusable. So the Incans carefully mined and cut stones that fit perfectly into one another, in order to stabilize the structures. Another example of Incan innovation can be seen in the layout of the garden terraces, which were carefully coated with topsoil and rocks in order to maximum water retention (this was very effective prevention against mudslides and flooding.) Despite its location and relative seclusion, by all accounts the Machu Picchu that the Incans knew experienced a great deal of trade and was included in the Incan road system. Evidence of this type of long distance trading is seen through the discovery of artifacts that are not native to the region surrounding Machu Picchu. Though Bingham’s discovery ultimately led to the creation of a UNESCO World Heritage Site, Bingham’s discovery was not always favorably viewed by the natives. At one point, Bingham was accused and vilified by the Peruvian press for stealing artifacts from Machu Picchu and smuggling them out of Peru. Despite being raked over the coals for this, there is no proof Bingham did anything illegal with the artifacts and in fact, any artifacts that he did take were removed in a legal and fair way. “Though she be but little, she is fierce!” I consider this quote quite applicable to myself when I was a little girl. More than anything in the world, I wanted not only myself, but also my mother to have the right to vote. She was the single person in my life that I would trust with anything, and because of that I wanted her to have a say on what was happening in the world. The decisions that my parents made at the time, regardless if it was at home or at a polling site, would turn into my future; I just couldn’t fathom the idea of my mother not being part of that. Mothers have a way of knowing exactly what is right for their children, so I knew she had to be given the same opportunity as my father to vote. Furthermore, my mother, just like many of the other mothers, sisters, aunts, and daughters at the time, had a strong, intelligent voice, but just wasn’t being heard. As just a little girl, I had this immense passion for women to receive the right to vote, and before I was even 10 years old, that right was granted. Fortunately enough, a select group of brave women ignited this cause approximately 30 years before I was even born. I’ll never forget that women spent time in jail so that I could have the right to vote, and I don’t know how I could ever repay them. However, as a woman, I always make sure that I make it to the polls so that my voice is heard. I do this for my family and I, but also for the women who lived in silence for hundreds of years. It just doesn’t seem right to me when people don’t appreciate the sacrifices that were made so that they could live the lives that they do. Let me also mention that as a little girl, this was a learning period for me. What an educational and inspirational experience it was for me to understand the power of women at such a young age. There are just as many women in this world as there are men, and together we can make a difference. I can guarantee that throughout my whole life, I never once was controlled or dominated by a man because I learned the importance of my independence at a young age. You could have asked me then, and you could ask me now, but I’ll always tell you that women are the future. I stand by that and work towards bettering the women of the future because I know my daughters and granddaughters will bring things to this world that no man ever could. I certainly am not biased towards women, as I love all my children equally and support them all the same, however I can say that because I’m proud of the world they live in. My only remark for other women who may see this is to keep pushing forward, and never settle for anything less than perfection. Fortunately for me, I am fierce because of everything I experienced while I was little. My grandfather worked in this plant. This is just one more example of how women have been abused in the service of "beauty." This photograph so wonderfully captures the entirety of the Woman’s Rights Movement. For over 50 years now, people everywhere have been protesting, pushing and fighting for the beginning of equal rights amongst men and women. You can see the big crowd which doesn’t even start to show how many people were involved in this. These strong women have worked nonstop, did not sleep, and sometimes even refused to eat to send their message. And their message has been heard by so many, including myself. My mother and grandmother are two incredibly powerful women who I can see clearly are capable of doing anything men can do. In fact, my mother raised me alone and I have no idea who my father is, and my grandmother gave up everything for me. The least they deserve is respect and acknowledgment that they can do anything men can do, and for this the 19th amendment must be passed. In this photo, the two women standing are truly changing history. As they encourage voters to pass the amendment, they are changing years and years of traditions, laws and the American culture as a whole. Their bravery and commitment is astounding, for their fight has been ongoing since 1848 yet they still fight without knowing how much longer they will have to. If I have a daughter one day, I will be certain she knows she can do whatever she wants to in life and she is never lesser than any man. If I have a son one day, I will teach him that women mean everything, that we must never lose sight of their bravery and intelligence. I don’t know what the future holds. By the time I have children, who knows if any laws will have been passed bringing equality for women. If these laws and amendments are passed, which the women in the photo are so desperately fighting for, I don’t know if this will bring a real change. I have spoken with and known men who are so stubborn, so set in their beliefs that women cannot be put on the same level as men. Perhaps I am not as brave as the women here, but I cannot change these peoples’ minds. I cannot make them think differently, for their beliefs are already so permanently set. What I can do and what I will do, is to teach my children correctly, so my grandchildren and all future generations to come will realize and understand the potential and strength that lies within all women. I don’t know when this movement in particular will end, but I do know this will be a fight that is long from over – but a fight that must go on, so I may continue to honor the women in my life. From the voice of Mohini Rajani: I admire the courage in these women. But unfortunately, I can tell you that it will not be enough. When I moved to Nigeria in 1960, the country had just gained its independence from Britain. Despite achieving a goal that had been sought for over 50 years, this was the beginning of internal chaos in Nigeria. In my early days in Kano, I had met some wonderful women; they were housewives who were extremely polite and had a few young children. The husbands of these women were in conflict with some of the local leaders over some politics and they had not returned home in 2 days. I met these women in the airport, where I saw them handing money over to some officers. It did not seem as if they had done anything wrong. And they hadn't. These women had given money to the officers to go through a gate which they had the authority to go through. The only difference was that their husbands were not with them, which meant that they were bound to be treated unfairly. Nigeria is and has been a patriarchial society, at least in my time spent here (1960-2004). 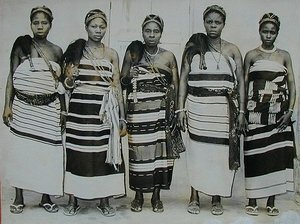 The women who led Aba's Women riot were particularly brave for standing up to not just British-appointed chiefs, but Nigerian men. 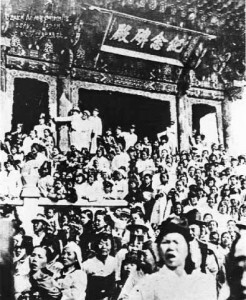 After enduring unfair taxes and harsh regulations that clearly favored men, these women responded tremendously by assembling in large numbers (25,000) and chanting/dancing throughout the nights. Some even adhered to violence and burned down courts that were ruled by British authorities. Many of these women were responsible for producing food to Nigeria's cities, so their actions were wholly justified. 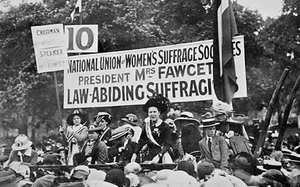 The majority of the women were also subject to mistreatment from their husbands, so they were fighting for more than just political and economic equality (although equality would never really be achieved). Additionally, although the British left around 1960, there has been no lack of corruption in this country. My own husband, when visiting me in India a few years ago, did not need a passport at the airport. Instead, what he needed was a full wallet. When I arrived in Nigeria, after my encounter with those women, I witnessed many riots in my first few days. They ceased after a few months, but eventually returned. Even though women were involved in the riots, I don't think they will realistically achieve any major changes unless education quality improves in this country. For that reason, my grandchildren have immigrated to America. After the emergence of the Reds and their establishment of the Union of Soviet Socialist Republics in 1922, all of Europe felt the effects. After the death of Lenin in 1924, Joseph Stalin came to power and suppressed all opposition to his ruthless rule. As this new political movement emerged, the Soviet Union established a communist form of government. Living conditions worsened and people suffered, however we were unable to escape the grasp of the ruthless ruler. While the system was idealized and seemed to be the passage to prosperity and growth, the truth was far darker and depressing. The Soviet Union was an unforgiving, secretive and radical country. Many events took place within the USSR, that are not well known to the outside world. For example, if you see your neighbor pick up a small bolt laying on the ground, and you tell the government officials that they picked something up, your neighbor as executed. This had everyone living in constant fear, as you didn’t know who you can trust and who will betray you. It is upsetting now to see that so many people still support this form of government when it was clearly so harmful and detrimental to humanity and our basic rights. The Soviet Union was a wealth of information, and a wealth of even more secrets. There were many occurrences that happened within our crumbling empire. We’ve experienced the death of a cosmonaut, undisclosed to the public and especially the Western world. We’ve experienced horrid famines, those which were also undisclosed to the outside world. Stalin was able to arrange multiple very carefully planned tours for outside leaders, displaying the grand prosperity of our country. Meanwhile, the truth was deeply hidden. By the time the 1937 consensus was made confidential, the famine was deeply suppressed. And while the death toll was as large as the Holocaust, the Soviet Union effectively hid the famine. On top of these events there were massacres, hidden cities and secret projects. The rise of the Soviet Union through Lenin may have been one of the most detrimental events to occur to our countries. It deeply saddens me to recount the events that occurred to our family and friends due to the strict rule and totalitarian government enforced in the USSR. I have friends and neighbors who have been killed and taken to jail for simple accusations and seemingly harmless acts. While I lived through a lot due to the Soviet Union, I am glad our country began to change for the better during my life time. I was able to see a slowly changing infrastructure, technological advancement and overall prosperity. I am glad the times of Lenin and communism came to an end, as I was able to live my finals years a free man. The historical evolution of the Russian empire and the Soviet Union play an integral role in my up bringing and education. I was in 1922 in Ukraine and the world around me was in the midst of a major transformation. Regardless the fact that I wasn’t raised during Lenin’s rule, the impact of his ideas and actions stilled echoed through Stalin’s government. The communistic propaganda was heavily controlling the education system, thus during my school years I learned a lot about the foundation of the USSR; specifically it’s future glorious goals. 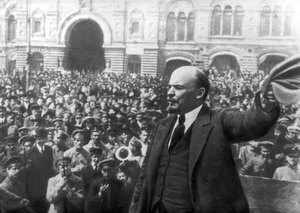 Overthrowing the tsar was a major progress and Lenin’s attitude towards achieving communism through implementing temporary socialism seemed as a very logical change, since the final goal of becoming a great, powerful nation was still strongly present. The secret of being exposed to partial truths and hand picked facts is that you become easily convinced that you have indeed been born into the greatest nations of them all. The inability to leave or receive any outside information had also contributed to the foundation of my and the majority of the population’s admiration towards the place we lived at. Please don’t misinterpret my words though; I love where I come from. I love it now and I loved it then. But life wasn’t easy. My nation was rapidly growing, advancing toward beautiful legendary goals, but as a small member of society abundance was a foreign concept to me, my family, and honestly to most simple men in my society. My dad initially ran a shoe-making store, and with Stalin’s uprising he felt the change in economic policies closely when he was forced to pay large governmental taxes in order to maintain his shop. He was the only one providing for all 7 of us, so you can imagine what life must have been like. Nevertheless, I believed in the communal goals of the government and understood that in order to achieve a better life we must struggle through the adversities of industrialization and collectivization in order to catch to the west. We had to be the best and we did everything we could to get there. I developed such an admiration to my nation that when the time came, in the late 1930’s and the USSR was making obligatory recruitments for the red army to fight in WWII, I had no doubt that I want to contribute. I was too young to be recruited, so I’ve decided to fake my date of birth and make myself older and I have voluntarily requested to join the forces! Many people around me had lost their lives, but my dedication to my nation did not weaken, on the contrary I’ve climbed up the ladder and become a lieutenant in my division. I’ve won medals and even got severely injured in Germany. Up to my last living day I was carrying a bullet inside me. It must be fascinating reading my positive outlook as an outsider, who has only heard about the deaths accumulated during Stalinism or the severely restricted life style. The admiration for our government and Stalin was so strong that when he passed away in 1953, our whole nation was weeping over his loss. We didn’t know what was to come and that was a scary time. Even later, when the USSR had fallen apart because we weren’t able to achieve our ultimate goals and the west was by far more progressed than us, we all still had positive memories and outlooks on our childhood and lives there. But, you weren’t there so I guess you can’t fully understand. In the voice of Charlotte Schulter: I was only a young girl in Charlottenberg at the time this photo was taken, but even so, I was impacted by World War I. My father somehow escaped the horror of it, but I was confronted with it with photos such as this one that showed that even when the soldiers were relaxing, they were surrounded by dirt and disease all around them. A countless number of my friends had fathers, brothers, and cousins in the War. We would play quietly and listen to our mothers whisper of the atrocities of it. They were trying to protect us from all that was happening at this time, but still we caught glimpses of newspaper pages and skimmed articles of the battles that were taking place. Besides, how could they hide the War from us? Even if we were unable to read or not able to hear the things they discussed in the kitchen, the War was everywhere we looked. There had been so much hope when the War began. Germans had so much pride in their country then; a pride that time and time again turned out to be dangerous. We were finally going to show Britain, Russia, and France who was really in charge on the European continent. We didn’t know back then of the horrors to come for our soldiers and for those on the other side: machine guns, poisonous gas, and costly battles fought from miles of trenches just for a little bit more land for each side. As the War went on, the enthusiasm dwindled as France, Britain, and soon even the United States beat down upon us. More and more of my childhood friends were receiving word that their loved ones were not coming back, as the number of dead rose from thousands to millions. We were lucky in a way though: the War never directly reached us. Some in the East of Prussia were directly affected, which occurred when Russia attacked them at the First Battle of Tannenburg in 1915, but that was the only battle close to us. Still, I remember thinking that it would never end, and that I would constantly have to hear of new horrors. After the War ended in 1918 and the dust settled across Europe, I left Germany 8 years later at age 20. I did this because the aftermath was too much for me to take. Even though I was financially stable as a clerk and I loved Germany, I needed to leave for the United States and start a new life. This was seen by some of my peers as a traitorous move; after all, the United States had fought us in the War. Nevertheless, it was new and exciting, and a place for me to build a new life for myself, somewhere far away from the memories I had of this horrid time of violence and death I grew up in. However, when I was far older, I did go back to my suburb outside of Berlin, and tried to replace my childhood memories of death and sadness with happier experiences. This picture is very foreign to me. Although I lived in the United States for most of my life, I never got to experience its education system. Coming from a small farm in Kappel I never had the opportunity to go out and pursue an education. My job was to always tend to the farm work with my brothers and sisters. If anyone were to get the opportunity for an education it would have been my eldest brother. That's just how the time was when I was in Germany. He ended up getting the farm as a birthright, so I feel like if anyone were to get educated out of my family it would have been him. Never getting any formal education made me want feel like it was essential for my own children. One of my sons, Robert, actually is currently a professor at Manhattan College. He has also written several books. He has really seized the opportunity the the United States gave to people. This is truly what I wanted for my children. He really ended up on the opposite side of the education spectrum as me. He became someone who teaches the future generations, and that is more than I could have asked him to do with his education. I am very proud. I notice that the picture that these students are looking at has to do with muscles, and parts of the human body. I have always been interested in this type of thing, but I knew that without the formal education I would never have been able to support my family. If there was one thing that I learned from living on a farm for some of my life, it was how important it is to get bread on the table. There is honor in doing any kind of work and helping your family be comfortable. That is why when I got to the States I took one of the only jobs that I could. I worked for Swift and Co, I did labor and worked as a butcher. This allowed my family to live more comfortable lives. Yes, I did have some very long days, and it did take a toll on my body, but it was what I had to do. As a I mentioned before, nothing is more important to me than putting bread on the table for my family. I worked as hard as a did in order to provide my kids with an opportunity to succeed. I would have put the same 110% effort into any job that I did, I was really that kind of person. This classroom reminds me of the very schools that I sent my kids too in Queens. I can only hope that they were as attentive as the kids in this picture, but I'm sure they were. Coming from a farm I felt like hands on work was the best way to learn, and I feel like schools would be better if it was more this way. In the voice of Narasamba Munukutla: Growing up in the 1920s in India was a time of witnessing great changes sweeping across our nation. The hero behind these revolutionary changes was truly a mahatma (“great soul”) named Mohandas Karamchand Gandhi. I still remember the glorious day when he came to visit my small village in Andhra Pradesh. I felt so lucky to see this wonderful man in person, an aged-fatherly figure who brought great honor to Bharat (India) and its people. I know I am not alone in saying that Gandhi Ji (“sir”, used as a term of respect) has united us all, and made us feel proud to be the free people of India, the nation that overcame the British Raj while holding steadfast to the spiritual virtues of nonviolence and peace. I am sure that my daughter and step-sons learn about Gandhi Ji at their school, but I still make extra sure to describe to them the many stories of Gandhi Ji’s well deserved successes through patience and determination, and the glory of achievement without ever straying from morality. I personally, as well as other women in my village, deeply admire Gandhi as a hero that we want our children to emulate. The typical male heroes in the cinemas we all watch always elevate men who are violent, and express their anger or disagreement through barbaric fighting; in complete contrast, Gandhi Ji is a kind and pure soul, one who practices sacrifice and complete renunciation of personal pleasures to achieve just actions for the good of the nation. During the time of India’s nationalist revolution, I remember each afternoon at tea time the men of the village would come together and fervently discuss the latest politics in the paper. New happenings such as Gandhi Ji’s hunger strikes and latest non-violent protests would be on the front page of our newspapers every week. Ladies were not typically included as part of these political discussions, as it was not considered proper for us to entangle ourselves with these heated matters; however, out of my natural curiosity for knowledge and my immense admiration of Gandhi Ji, I would listen intently and pick up some information of the most recent events, including his contributions to helping the oppressed Indians living in all parts of our country. Living in a village, it is quite rare to see people travelling to far places. I was intrigued when I found out that Ghandhi Ji travelled as far away as South Africa to help fellow Bharatiyas (Indians) living there to overcome discrimination by the Transvaal Government; when Indians were unjustly asked to present registration cards to identify themselves, Gandhi organized a peaceful demonstration to burn these cards, to bring about change. To hear of Ghandhi Ji always filled my heart with joy, and I would pray for his continued health and strength each day in my morning prayers. I saw him as a man who adhered to dharma (righteousness) and ahimsa (nonviolence), the virtues prescribed in our Holy books, namely the Gita and the Vedas, and he had strong faith that this would get him through the toughest situations. Gandhi Ji set an example to the world that great positive change can take place without the destructive and divisive forces combat. To me, this is the ideal of true bravery. Lenin didn't live long enough to ensure the success of the revolution. The sight of these German soldiers fighting down in the trenches makes my heart go out to our own troops fighting to protect our freedom. I feel a solemn connection to the American soldiers and our allies fighting to protect democracy in Europe from the tyranny of the German Kaiser. However, I do not harbor any ill will toward the enemy troops for it is their despotic leader and I unjust government I dislike. While I vehemently support America’s role as a global leader and defender of freedom in the world, I absolutely abhor what is going on in Europe now. It is the War itself that I cannot stand, not its geopolitical undertones. Even these soldiers who are our enemies are still people and my heart goes out to their wives and children as much as for our troops. It’s strange seeing the perspective of the enemy and sympathizing with the troops of the Kaiser we’ve sworn to defeat. However, these men are simply serving their country and protecting their home the same as ours despite the fact that they and their allies are the aggressors in this conflict. The senseless violence being experienced by the troops down in the trenches, suffering shell after shell of bombardment not knowing if they’ll survive transcends even national divides. On a universal human level war devastates our very souls regardless of which side you’re on. What’s worse is if what we’re hearing about use of deadly poisons like this so called mustard gas is true, the suffering of those troops is something I would not even wish upon our worst enemies. However, that does not excuse the inhumane horrors that the Germans are guilty of by unleashing these weapons. While I am now too old to serve being in my fifties, I would gladly serve my country if I could and I show my support for our troops everyday. All I can do on the home front is pray for all the young men overseas to safely return home to be with their families who must be desperately missing them. It is my hope that this bloody conflict will end soon and that democracy will prevail to ensure freedom and justice in the world for generations to come. When the dust finally settles, this will be the bloodiest conflict humanity has ever and hopefully will ever experience. With so many millions of people dying it seems like this will be the war to end all wars. I can only hope the horrors and devastation of this war will show the nation's of the world how futile warfare truly is. After all it was intense militarism and hatred that created this conflict in the first place. All this war has shown is how violence begets more violence. It is for that reason that I am so thankful to be living in such a peaceful country and am truly blessed by God to have all the freedoms and liberties of America for myself and my family. The Japanese invaded Korea and took over our country, ruling with an iron fist. Their methods were questionable and often cruel. 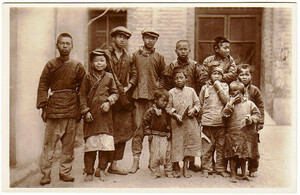 What plagues the mind of Koreans the most is what the Japanese did to our people, our land, and our history. Ever since I was a little boy, Japanese military police marched through towns followed by their Korean aides. In those days, Koreans weren’t called policemen, but rather assistants. The colonial government wanted to secure the country to its own advantage so it bribed and recruited Korean men who could speak Japanese. I remember seeing the father of one of my schoolmates wearing the sleek black uniform that represented that he was with the Japanese military police force. Our troubles came, not just from the Japanese, but from our own men as well. After the Japanese occupation, many Koreans used guerilla tactics to fight the Japanese. They called themselves the Independence Army. They forced the wealthy families to give them money to support their fighting. The father of one particular family refused to pay and the soldiers killed him on the spot. The Japanese were not only robbing us of our culture and our freedom; they were also taking away the unity between Korean brothers. People felt that something had to be done to combat Japanese policies. By 1919, Japan established its authority over Korea through direct military rule and violence. I was seventeen years old at this time. Energy for a Korean independence movement grew as more citizens became more courageous and willing to stand up and fight against the Japanese. Their resentment increased after our emperor, Emperor Gojon, was allegedly poisoned and died. On March 1st, there was a non-violent protest in Seoul. Since I lived many a province away, I did not attend, nor did I wish to. I saw people get arrested, often without any idea of what was charged against them, The most innocent act could bring unexpected repercussions. There were also many people who rebelled openly. They were often executed or tortured. Personally, I did not love the Japanese and everything that happened during the time they occupied my country. For the sake of my family, I wanted to maintain amiable relations with the Japanese and not do anything that would put them in danger. Japanese imperialism was not always as horrible as people say. Speaking from personal experience, as long as you minded your own business and followed their rules, you could survive. And it wasn’t a life completely wrought with fear and trepidation. The Japanese also brought many advances to our country. Whenever we had a rainy season, our village flooded. The Japanese came and built reservoirs, dams, and bridges. The bridges they built in my village lasted through all the rains and flooding, which was very helpful to me on my farm. One of the taxes had to be paid in rocks. Each family collected a certain amount of small rocks to be collected, and these were used to build roads. Although I am not justifying what had happened during the Japanese imperialism, I do believe that without it, Korea would not be as advanced as it is today. 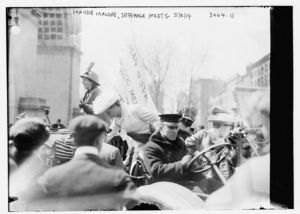 Some leaders had written a Proclamation of Independence that was to be read at the March First Movement. Sadly, thousands of people were either killed or wounded for participating in the demonstrations that would arise throughout the country in the following year. Although the movement failed at its goal to put pressure on Japan to end its colonial rule in Korea, sign and read the proclamation, it created a stronger sense of national unity among Koreans. In that sense, I believe that it was a great victory for Korea. 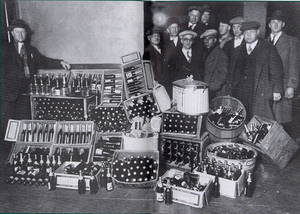 Prohibition. As a woman whose life has been greatly impacted by alcohol, I am nothing but torn by this issue. My Italian heritage has integrated it into so many aspects of my life. I use wine to cook. I soak my desserts in rum. My sweet tooth has made me cherish these alcohol soaked pastries and cakes. I’ve already passed the taste onto my grandchildren, knowing fully that they will pass it on to theirs. A piece of our culture will be passed on because of this drink. Even our religion tells us that wine is to be the symbol of God’s body. We drink a small amount during communion to recognize Him and His sacrifice. Wine is sacred to me because of this. But alcohol is also the reason my skin has had to grow tough. It is the reason I have scars all over my body. It is the reason fear would strike my heart every time I thought I heard the door opening late at night. It is the reason I protect my children’s lives with every fiber of my being. Alcohol is the reason my husband turned into a nightmare. It grabbed a hold of his heart and twisted and morphed it to where I would not recognize the man who beat me to be the same man who I said my vows to on my wedding day. Alcohol is what enhanced my husband’s anger and restrictions. It is what warped his mind to think tying me up in that field was what was best to punish me for a crime I was not aware I had committed. It is what let him think that pulling that trigger was what I needed in order to be shown that I must be a better wife and mother, something I dedicated my life to. Alcohol has made my life hell, but it is also what connects me to my heritage, my culture. Having it banned placed a slight relief on my heart. But, to say the truth, it came too late. By the time alcohol was banned, I had already separated from the man it had corrupted and I had learned to continue to trust it through my culture. By the time it was banned, my relief was overcome with annoyance. My culture was to now be limited. Where I had found my safety. Where my family lies. Where I had taken solace was now limited. While I myself did not drink a large amount of alcohol, it was a venue by which I could connect to others. Through my food, I am able to communicate comfort and love. When it became limited, I was disheartened. Something I had wanted to continue giving to my children and grandchildren, was labeled as wrong and against society. And while I do agree with it in certain respects, I do not think the entirety of alcohol should be banned. It is something that is a part of cultures. It is a part of people’s identities, and to have it banned altogether is not something I agree with. We were independent for a year...and then the statues came up. In the voice of: Bhadase Sagan Maraj The way that Indians are treated around the world continues to shock me. For so many years, the Indians have been a proud and successful people, developing one of the most unique cultures in the world. Yet, we continue to be subjugated and belittled, this time by the Transvaal Government of South Africa. It seems that we are discriminated against no matter which part of the world we are in. Here in Trinidad, brought over as Indentured Laborers, we have no rights, no representation. We were brought here under false pretenses, promised a fair shot of success. On the exterior, people of Indian descent may look meek and easily targeted, but we have an unbreakable spirit. That young man leading the resistance against the government, Mahatma Gandhi, epitomizes the spirit of the Indian. No longer are we going to be discriminated against, we deserve fair treatment just as anyone else. His method is unusual to say the least, I would initially think that such injustice would incite anger and violence, leading to a “revolution” mindset. However, it takes a strong, well-articulated and charismatic young man to be able to collect the masses together in such a way that they will be able to demonstrate against the discrimination in such a peaceful way. No doubt he was met with anger and animosity, and surely there are those in the crowd that would have preferred to pick up arms against the British Empire. But Gandhi would have known the strength of the Empire, this would be the loss of lives in futility. The average person may not see the importance of burning the very registration card that the government is making mandatory, yet the message is so strong and powerful. Simply, the Indians are saying “No”, they will not respect the wishes. It takes away the power with a simple flick of a match. 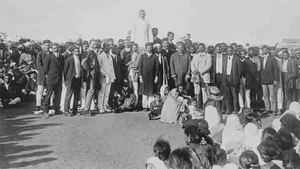 The actions of all these Indians in South Africa is to resist discrimination, without yielding to the sordid actions of the British Empire. If we Indians pick up guns and knives to fight and rebel, we will be seen as savages, as lesser creatures than the whites. It will undo all the progress that has been achieved and give them a reason to take arms with their more sophisticated weaponry. Everyone is entitled to a certain type of life, we should not be discriminated against because of the color of our skin, the language we speak, or our religious beliefs. That young activist leading the group, he knows that we must all stand united, and forge ahead in creating a level playing field. Violence may not be the wisest way to go about it, especially when the British Empire is at the strength that it is. They rule us here in Trinidad as well as the majority of the other islands in the Caribbean. Ironically, we are now referred to as the British West Indies. I see B.W.I. written on all the mails and papers that are scattered around the country and on the shipping labels on the sugar estates and rice paddies. It is only a matter of time till the same that is going on in South Africa and in other parts of the British Empire spread to us here in the British West Indies. We all deserve a fair chance, and the discrimination that we face is absolutely horrid. The Empire will not hold the power that it does for much longer if people are discriminated against in such ways. These ladies fought for my mother, aunts, sisters, wife’s, and now my daughter’s right to a voice in their government, and for that - I thank them. It is moving to see these women put their lives and reputations on the line for something they strongly believed in, despite all the efforts to silence them. I can only imagine how hard it would be to stand tall when a man yells at you for your picketing and spits in your face, especially 15 years ago in 1914. My sisters tell me of the gossiping it caused at their school, as the young boys loved to tease the girls over it - which caused a whole lot of teasing and fights among them. One of my older sisters, Helen, told me how their teacher Sister Rose, would punish any of the girls who would speak about it, even at lunch time. She said her friends and herself got in trouble a few times while gossiping about the arrests that happened outside of the white house, which they heard their parents talking about over breakfast and the newspaper. Having not been born yet, I only hear of the fights it caused within my own family, as my two older brothers were down right disgusted with the “audacity” and “nerve” of the women to picket during a wartime - let alone at any time. Although they are much older than me, I do not see how they could sit across from our loving sisters and hard working mother and refuse to support their fight for rights - for the women in our lives now and the women who we would marry in the future. I have nothing but respect for the Suffragettes because of my beautiful daughter, Carol, who will now live in a better world thanks to their efforts. During the movement 15 years ago, I’m sure I would have had some mixed emotions because I was not the man I have grown into today. As a teenager, I’m sure I would have huffed and puffed at these girls trying to fix the country, much like my older brothers - but now I wouldn’t ever think twice. As a man who deeply respects all of the women who have touched my life - from my hardworking Irish mother who came from nothing and raised 7 kids in a small Brooklyn apartment, to my four lovely older sisters who would step in and be my mother when need be, to my beautiful wife who has changed me for the better (even when I want to rip my hair out but bite my tongue instead), to my beautiful daughter - who I will always want the best for, especially when I’m gone and can’t be here to protect her. Although I can sympathize and excuse the children and teenage boys of this time for being naive and ignorant, I do not understand the grown men who objected the cause of these women. Every single one of us has a woman in our lives that we are grateful towards, and we would not be here without - our mother, so for them to spit at, criticize, and attack these women is as bad as attacking our mothers. These men were denying the rights of their mothers, wives, sisters, and daughters - which is something I could never do and be proud of. Perhaps it’s the Irish Momma’s boy in me, but I cannot fathom ever standing in front of these women and booing, spitting, or screaming - instead I would admire their strength and courage. I am thankful for the women who had the courage to speak up, defy the odds, and risk their freedom all for the good of the women in my life, who I love and admire very much. - John J. Brown. I think the question everyone asks about the flu epidemic of 1918 is why isn’t better known? Why isn’t it part of our national narrative? The next question for me is since the epidemic was world wide, and devastating world wide, how did it fit into the other nations’ narratives of themselves? I wonder if we don’t remember it because it doesn’t have clear moral or practical aspects. It was totally democratic and killed all types of people seemingly indiscriminately. It was unstoppable—the size and the speed of the epidemic were overwhelming. And it was terrifying. You could follow its approach through neighboring states and then towns and then blocks. Worse perhaps, was that you could get it from anyone. In fact you would be most likely to get it from someone you were close to—a friend or a family member. It made everyone paranoid about everyone else. And it was fast. You could be healthy—and most victims were healthy, the young and healthy seemed oddly more at risk than others—and yet you could catch the disease and then like many people you could die within 12 hours, die a terrible death through drowning in your own bodily fluids, which would fill up your lungs. It was also speedy in how it spread. Over 650,000 Americans died—more than the combined total of American fatalities in World War I and II, along with the Korean War, the Vietnam War, and the Gulf War. Worldwide, over 35 million people died. That is staggering . Even more so when you realize the bulk of the deaths took place in a ten month period—from March through December of 1918. I think part of the reason it was dealt with so inadequately, and also why it hasn’t become part of our cultural narrative, is that it happened so fast, and we humans often need a little time to grasp a new reality before we start dealing with it or narrating it. I wonder about my grandfather, Daniel Carney Sr. In 1918, he was living in Troy, New York with his wife and two infant children. It is difficult to find a lot of information about how the flu was handled in Troy. I know that Albany closed schools and theaters and tried to end all public gatherings. I also know that there were 5,000 cases of the flu reported in Troy and that there were 147 fatalities in Troy. My grandfather was a plumber, and a union executive. He worked in many bars in Troy, which was one of the central parts and appeals of the city then. Did he lose work during the flu? I’m sure he lost sleep over how to protect his babies. Like all good Irish immigrants he must have believed that “cleanliness is next to godliness.” I’m sure he, or more likely his wife Veronica, scrubbed and re-scrubbed everything in their home. And I am certain they prayed, they did novenas and lit church candles. I have so many questions about the epidemic, and very few answers. Why did it happen and why then? Its end almost corresponded to the end of World War I. Besides the soldiers spreading the disease, did the War impact the flu and its demise in any other way? I am fascinated by all the calm and misleading information that officials gave out throughout the duration of the epidemic. I am also curious as to why it is so rarely mentioned in reports on World War I. Over half of the fatalities from the war came from the flu, not the battles. That also is staggering to me. I’d love to get a better window into the minds and the fears of people alive then. My final curiosities are centered on what we can learn from this epidemic to help with future ones. Because of course there will be future ones. I think the main lesson that I have gleaned from my research is that you have to deal with what you see, not what you know. People knew that there was no flu that could kill 35 million people in a little over a year. People assumed the flu could not be as bad as some said, nor as easily transmitted. And yet all of these beliefs and assumptions were being contradicted by what people were witnessing every day. Believe what you see, not what you know or expect. Life is always a surprise. I welcome thoughts on this disaster, or on how your ancestors dealt with it. I’d also be very curious about what issues the epidemic raises for you, and what lessons you believe we can learn from it. There is no doubt that the epidemic was a major concern in the late 1910’s. I am sure that my ancestor, who was barely in his twenties when the epidemic struck, was very concerned with this plague. Since he was the breadwinner of his family (consisting of himself and his younger sister), becoming ill would have been devastating to this poor Italian family trying to make a name for themselves. Perhaps the tale of the epidemic was not written into our cultural narrative because of how common death was. 1918 marked the end of World War I, which was a war that tallied millions of casualties worldwide. The epidemic in the United States barely caused half a million deaths to Americans. Even though this number was much larger than the combined total of American casualties in many wars, I feel that the War overseas held much precedence over the plague here at home not only because of how much more massive the war was as a whole, but also why the people died. It is easy to die from illness; anyone can do it. Yet, it takes a brave soul to die for his country. Though many of the war deaths came from plague (not battle), there is nothing valiant about saying your men died from disease instead of in battle. Also, the Americans who died from the plague could be anyone from a homeless man on the street to an important government official. Even more, if one of the victims was a recent immigrant to the United States who barely spoke English and was working lower class jobs, I am sure that history would find no need to report the death as important. It is very easy to write civilian deaths off as meaningless when compared to the deaths of soldiers. When choosing which event was more important to pass down- war or plague- I am sure that the war held much more weight. I know my ancestor was in Brooklyn, New York in 1918 when the plague struck. I am also sure that he was very worried about the plague. God forbid he became ill. This would have ruined his entire journey to America and hopes to start a new life for he and his sister. Since he was a very religious man, it is easy to assume that he would have turned to the Bible for answers. He most likely attested the plague to God’s will. Perhaps he saw it as an omen that his moving to America was done in bad taste. If he stayed in Italy, would the plague have been there? I am sure the plague made him question his intentions for coming to America. He must have prayed often and went to church in hopes of avoiding the epidemic. Maybe he correlated the plague with the World War, and thought that the war should stop. He valued peace. I think the epidemic from the 1910’s speaks strongly into our modern era. Many diseases that we thought we eradicated with vaccines are now coming back because people feel that they have a choice to vaccinate their children. Sadly, these decisions are done in poor taste, and diseases like the measles are showing up again. I think the epidemic can teach our society that diseases are not a joke, and do not warrant a choice between vaccination or lack thereof. It is important to take all precautions to prevent an epidemic of the 21st century. 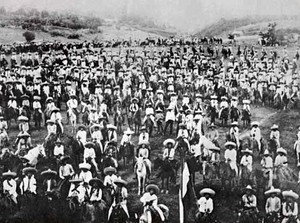 This image is way too familiar with me…The flu epidemic occurred shortly after the Pancho Villa Expeditions during which I was stationed in Texas, and at times had to cross the border into Mexico in order to calm the uprisings. 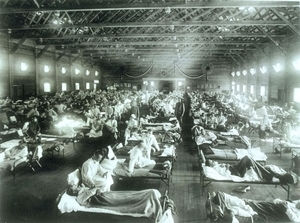 Some would say that it was by luck that I was not in combat during the epidemic as young and healthy soldiers made up a large portion of those who succumbed to the flu, but in my case this was not luck as I had returned to my family’s home in Philadelphia, Pennsylvania where an entire quarter of the population contracted this disease. My luck was not in being released from combat, but it was in the fact that my family and I were not part of the thousands who died in our city in the few months that the disease ran rampant. Regardless, this epidemic hit me hard as I lost many friends from the neighborhood to the disease including my best friend. His name was Mitchell… Mitchell Black. I met him upon arriving to Philadelphia back in 1908- we were both approaching twenty years old and worked at the Stetson Hat Factory (we also both ended up in the 14th Cavalry Division of Fort St. Houston in 1913). His family was very anti-Semitic but he was different- he did not care about one’s race, religion, ethnicity- he just cared about personality (and one’s ability to have fun- that was a must). He risked so much for me by admitting to his family that his best friend is Jewish- his parents stopped talking to him because of this; his relationship with his family was never the same… that is until he got sick. Since we had returned from Texas, we were back to working at the hat factory, and on the morning of September 21st 1918 him and I were on the train to work along with a bunch of other workers when I noticed Mitchell had a severe nosebleed. 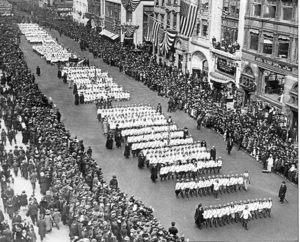 The other workers and I were concerned as the flu had reached Philadelphia earlier in the month and was beginning to spread. Mitchell tried to assure us that a nosebleed is rarely a symptom of influenza, especially when there are none of the usual symptoms such as a sore throat and fever which he said he didn’t have. And we just took his word for it; none of us went over and felt his head to confirm that he had no fever or anything like that. A few hours later though, during our lunch break, Mitchell passed out and was covered in sweat and shaking. 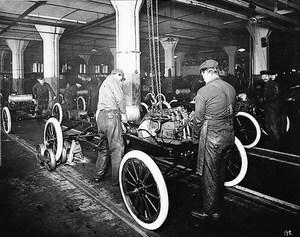 The American Red Cross provided ambulance service at the time so they came to the factory to bring Mitchell to the hospital. I was not able to go with them as the ambulance was almost filled to capacity with the sick. I knew that Mitchell’s family would never listen to me, but I felt useless not even trying to get in contact with his family. The factory closed for the day after Mitchell was taken to the hospital in fear of his disease being spread (they wanted to decontaminate the factory overnight so that the workers could return the next day- little did they know that normal methods of decontamination did not apply to this flu). Once I was off the train I headed to the apartment of Mitchell’s parents apartment. They saw me at the door and slammed it on my face. I yelled for them to listen to me, that Mitchell was severely ill and they called me a “lying Jew.” But once I was able to name the hospital the ambulance said they were taking him to, they must have believed me as they opened the door with a look of dread on their face (they had heard the usual outcome of this strain of the flu), they looked at me for a few seconds, and headed over to their car to try to see their son at the hospital. It was rare that even family got to visit the patients for extended periods of time, and when I tried to see him, one of the nurses said “Why would you even want to visit him if it almost guarantees your own death?” Yes, that was true but it was also true that almost everywhere I could go was contaminated by the disease, so I ignored her and walked right past her into the hospital ward where I was able to find Mitchell after ten minutes of searching the hundreds of beds- at first I feared he was amongst the dozens dead who were covered by blankets, waiting to be removed so that another patient can take their bed. He was very weak when I found him with blood (mixed with sweat) covering his mouth and nose, but he still managed to smile upon seeing me. He barely could speak but he thanked me for contacting his parents as he didn’t know what he would do if he died leaving their relationship the way it was. He said they had just left to find a priest to read him his last rites (they eventually did find one who was stationed at the hospital due to the immense number of dying patients), but before leaving they apologized for their reactions to him having me as a friend; they wanted to believe that the flu was a punishment to Mitchell for befriending a Jew, but were convinced that it was actually a punishment to them for writing off their son (I later tried to convince them that Mitchell’s death was not his or their fault but I don’t think they ever fully believed that). I left when the Priest arrived and a few minutes later, Mitchell passed away. He died around 3:00AM on September 22nd, only 15 hours since he was brought to the hospital- less than two days before, I was eating lunch with him and he seemed completely healthy other than an occasional sneeze. I didn’t even notice this until after his death, when I was reflecting on whether he would have survived if his symptoms were caught earlier. After his passing, I expected to never have contact with Mitchell’s family ever again because of their feelings toward me but a week later, his mother knocked on my door and apologized for her family’s behaviors towards me and thanked me for contacting them when Mitchell got sick as if it weren’t for that knock on their door, they would have never been able to make up with their son and say goodbye to him. I cannot say that they were not anti-Semitic anymore, but they understood me in terms other than my religion… they saw me as a man, a worker, and greatest of all, they saw me as their son’s best friend.